Your own private media room with 80" HDTV with bluray, DirecTV and Free Netflix. 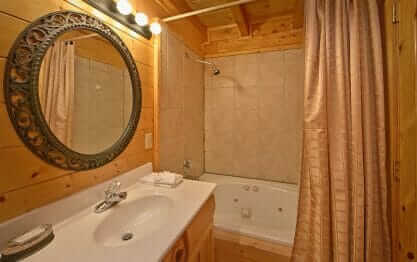 The perfect romantic 1 bedroom luxury cabin located close to all the fun. 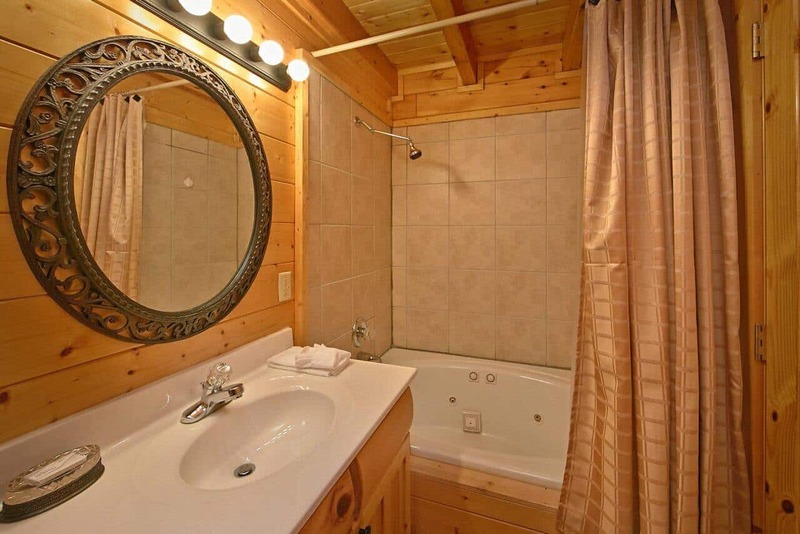 You and your special someone will relax and enjoy the many upgrades of this cabin including the covered decks, hot tub, gas fireplace, free WIFI, Jacuzzi tub, foosball table and luxury furniture. 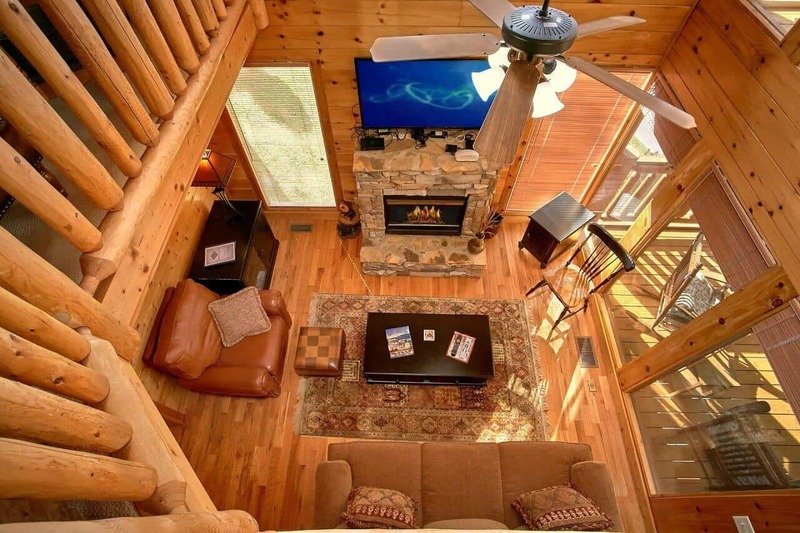 The open lofted floor plan with exposed beams and covered decks give the cabin the character most sought after by visitors looking for the luxury cabin experience. 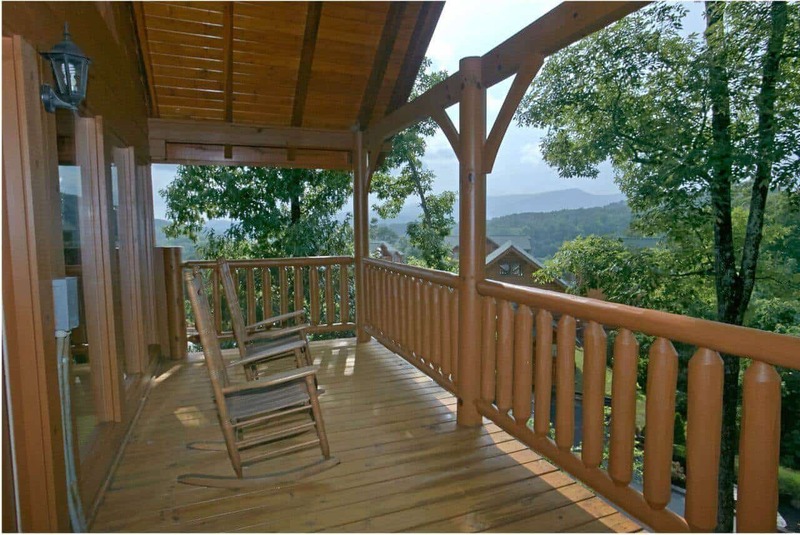 Think of a place where you can wake up and enjoy your morning coffee while sitting on a porch rocker on your own screened in covered deck while enjoying the sites and sounds of the Smoky Mountains (without the bugs!). You'll love watching a game on your 80 inch HDTV with DirecTV. 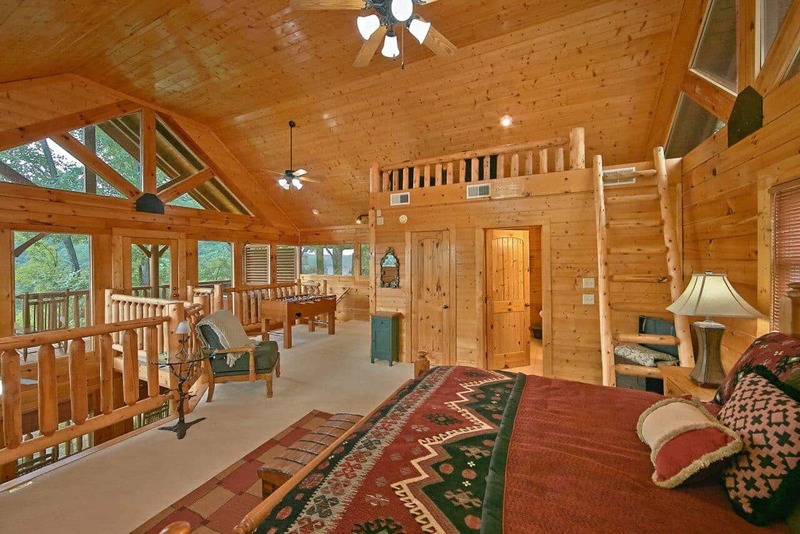 Sweet Retreat is a perfect getaway cabin in mint condition for you and your special someone. Prepare in cabin meals in your fully equipped kitchen including pots and pans, mixing bowls, mixer, blender, toaster, coffee maker, dishwasher, stove and microwave. 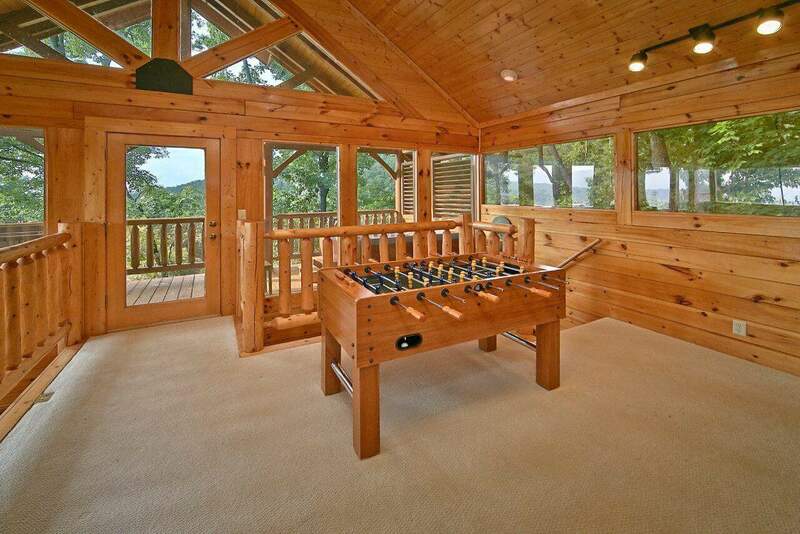 Play a game of foosball or head to the covered deck and enjoy a 102 degree soak in the hot tub. The loft master suite includes upgraded bedding as well a full bath with Jacuzzi tub. 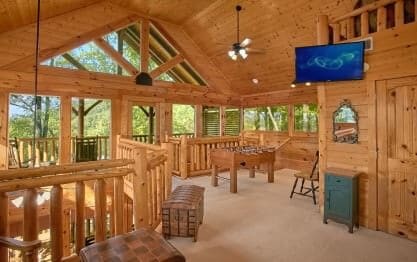 My wife and I rented this cabin during our daughters spring break where her team played at The Ripkin Experience (softball) which was only a 10 minute drive from our cabin. The cabin was so cute, cle…an and big for 2 people. We enjoyed the hot tub one evening on the balcony. Very clean. The linens, towels and dishes were all clean and looked brand new. We took advantage of the washer/dryer which was very convenient. Very pretty view of the mountains and even though we were around several cabins, we still felt very private. Our daughter stayed with her team in a larger home up over the hill so she was only a minute away. The management company does everything thru email, but they did call to confirm we got our code to enter the cabin and texted us when the cabin was ready for check in. I would recommend this place. We appreciate your business and your wonderful review, Richard! 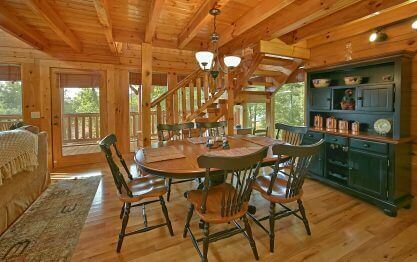 You definitely chose a beautiful cabin to relax in and enjoy some time away from the hustle and bustle of everyday life. It is delightful to hear that everyone had such a great time! Thank you for all recommendations, and we hope you too will make plans to visit with us again on your next trip to The Great Smoky Mountains. Remember, as a repeat visitor you will save 10% on future stays. Thank you! 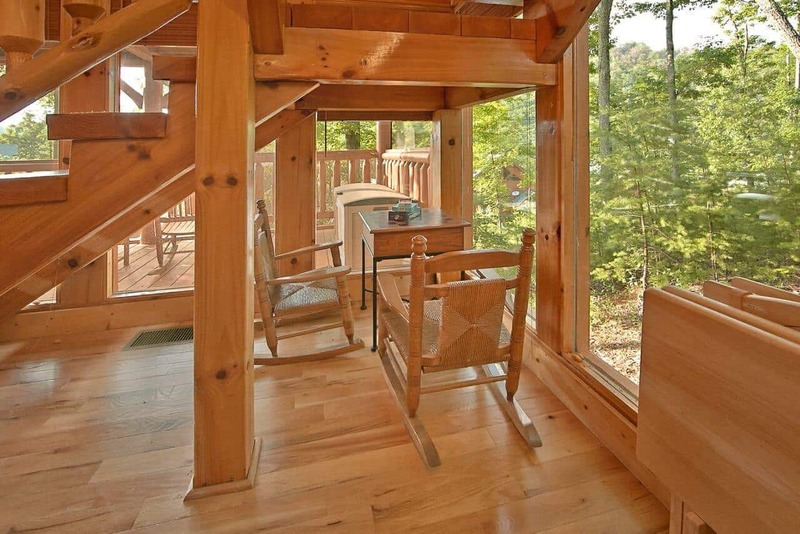 "Wonderful cabin & terrific customer service!" We are delighted to hear you enjoyed your recent cabin stay, Michael! It would be a pleasure to serve you again in the future. Don't forget to mention you are a returning customer to receive 10% off your next booking. See you soon! This was a very nice cabin in a terrific location. Will stay again! Thank you for your wonderful review, Dale! We look forward to your next visit with us. Please don't forget to mention you are a repeat visitor to receive 10% off all future bookings! 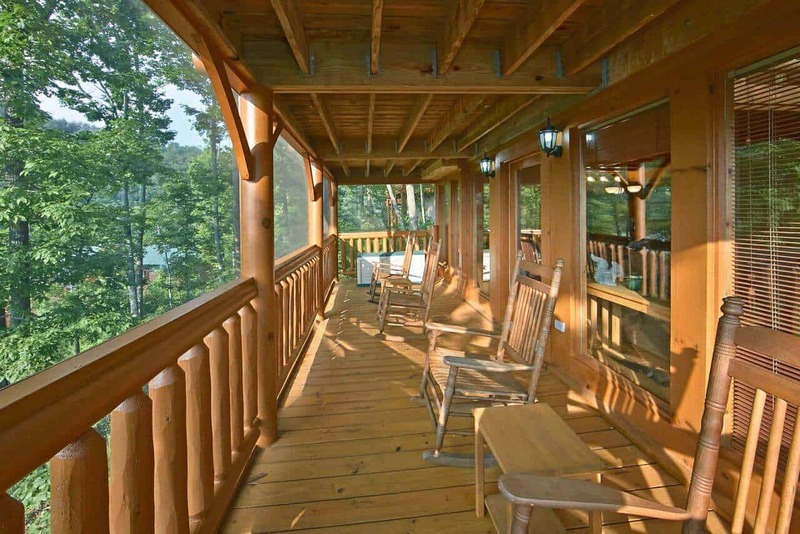 The property is in a fantastic location; far enough away to feel like an escape, but close enough to attractions that a trip to Pigeon Forge or Gatlinburg isn’t inconvenient in the least. The c…abin is tastefully furnished, well-supplied, and wonderfully cozy. A well-maintained property where I would stay again without hesitation! We are happy to hear you enjoyed your stay, Brett. 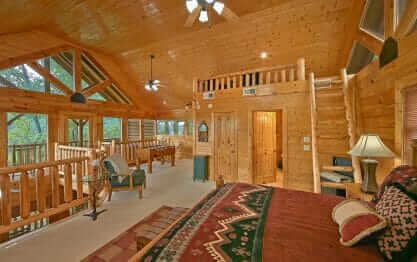 Sweet Retreat is an exceptional cabin that is perfect for creating memories that will last a lifetime. It is fantastic that you were able to enjoy some of the local attractions. We hope you will make plans to stay with us again on your next trip to The Great Smoky Mountains! Don't forget to mention you are a repeat visitor at the time of your next booking to receive 10% off. Looked just like the pictures. Cabin was in impeccable condition. Location is prime!! Definitely will be returning. Thank you for your fantastic review, Rashenda! 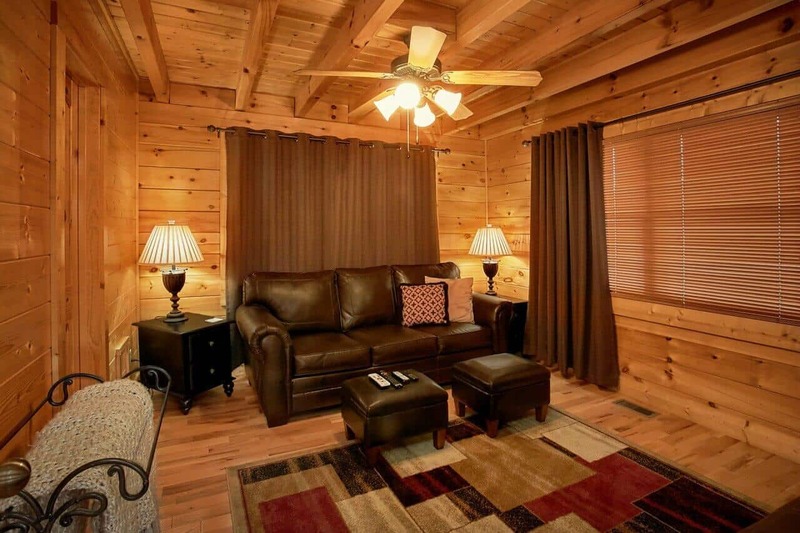 Sweet Retreat is certainly a great cabin, and we are pleased to hear you enjoyed your stay. We look forward to your next visit with us! We loved the cabin. It was located in a serene community and contained all the amenities to provide comfort and relaxation. It is tastefully decorated and extremely comfortable! Not too far to get …to many things to do, including all the attractions in Pigeon Forge. We would definitely recommend the cabin and Elk Springs, provided outstanding customer service. Thank you for your kind review, Anita! We are delighted to hear we exceeded your expectations. We enjoyed having you as our guest and hope you will consider staying with us again during your next visit to The Great Smoky Mountains. Please keep in mind, as a returning guest you will enjoy 10% off all future stays. Hurry back, new memories are waiting to be made! Great cabin. Very clean when we arrived and was a really neat place to stay. Will definitely go back again. Thank you for sharing your experience with us, Zane! Customer satisfaction is very important to us and we strive to make sure every guest has nothing but an amazing vacation! We appreciate your business and look forward to your return stay with us! Everything was provided as shown in the pictures. We had zero issues and were checked-in on periodically. Overall a 5 star experience. Thank you for your 5-Star review, Samuel! We are excited to hear we exceeded your expectations. We enjoyed having you as our guest and hope you will consider staying with us again in the future. Hurry back, new memories are waiting to be made! I loved my recent stay! My wife and I needed a relaxing vacation and this cabin was perfect. It ws easy to find and was very neat. Theater room ws a bonus! We will definitely be going back soon! Thank you for your fantastic review, Jon. 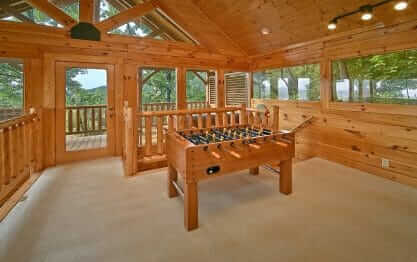 You certainly chose the perfect cabin to relax and create lasting memories together. We hope the two of you will make plans to visit again very soon. Please keep in mind, as repeat customers you will enjoy 10% off all future bookings. Hurry back, new memories are waiting to be made! We spent our 25th anniversary at Sweet Retreat. It was everything we had hoped for and more! The cabin was so clean and tastefully decorated. The view from the bedroom is incredible! The clouds in… and over the mountain were ever changing and we didn't want to leave after spending a week and waking up to a different view every morning. Elk Ridge Resorts was easy to work with and responded to our one maintenance issue immediately. The hot tub was leaking and they were able to get someone out to fix it within an hour even though it was the weekend. We spent every evening in the hot tub on the deck watching the stars. 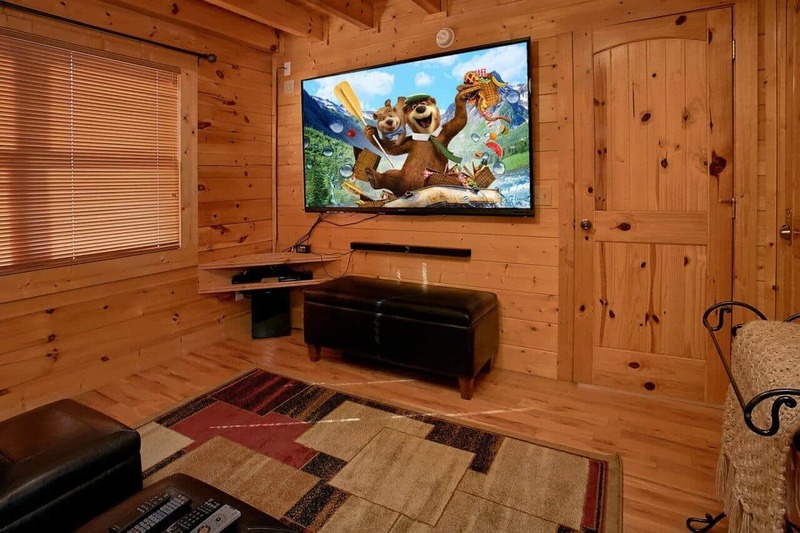 I would say the only downside to this cabin would be that it is in a neighborhood of cabins, so if you are looking for something isolated out in the woods, this cabin is not for you. Everything inside and out was so beautiful, though, that I would recommend giving it a try even if you thought you wanted isolation! When you are laying up in bed looking out the windows it feels like you are in the middle of nowhere! The cabin was wonderful. We thoroughly enjoyed our stay. Everything was beautiful, and we loved the 80 inch TV and hottub on balcony. Thank you for your kind review, Stephanie! We are happy to hear you enjoyed your stay. We enjoyed having you as our guest and hope you will make plans to visit again soon! A Sweet Retreat was beautiful! It was very comfortable and has a TON of natural light that floods the entire cabin. It is nicely decorated and has a very welcoming/homey feel. The property c…an actually sleep 6 even though it is advertised as a one bedroom--there are two sleeper sofas..and two full baths. I'd highly recommend this cabin and will definitely stay here again. 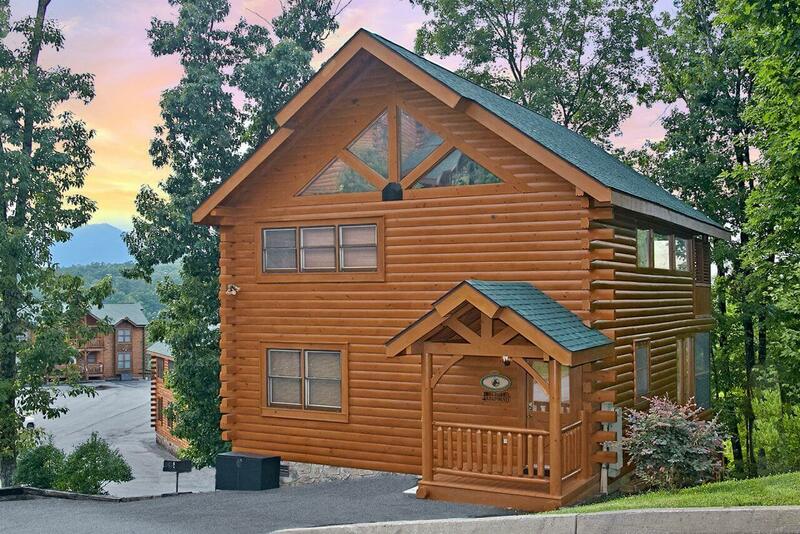 It's so close to all the action of Pigeon Forge and easy access to Gatlinburg. This is a gem! Thank you for sharing your wonderful experience with us, Jeremy! We want you to feel at home during each visit with us. We enjoyed having you as our guest and would consider it an honor for you to stay with us again. Please keep in mind, as a returning guest you will enjoy 10% off all future stays. Hurry back, new memories are waiting to be made! We loved this cabin. We really enjoyed the open bedroom with windows where we could see the mountains around us. We plan to come back and stay here again. We appreciate your great review, Steve! 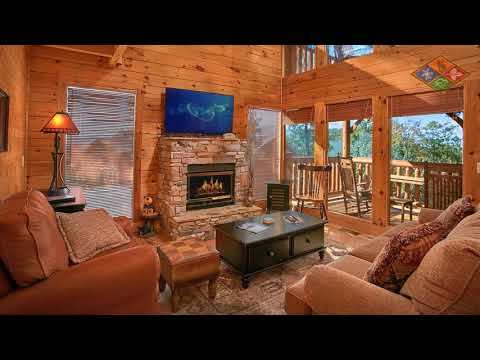 It sounds like you chose the perfect cabin to relax and escape from everyday life. We look forward to your next visit. Please keep in mind, as a repeat guest you will enjoy 10% off all future bookings! It was a very relaxing vacation, the cabin was wonderful. Would recommend to anybody. I prefer a bedroom that can be darkened and with this one being upstairs I was unable to do this but that is jus…t a personal preference of mine, nothing negative about the cabin. Thank you for your kind review, Lisa. We are overjoyed to hear you had such a great time at Sweet Retreat. We hope to become your home away from home while visiting the area. Please keep in mind, as a returning guest you would enjoy 10% off all future bookings! I enjoyed the cabin. It was clean and it was so nice and quiet. I definitely would go back and recommend to others. Thank you to Elk Springs Resort for such a great weekend! Thank you for sharing your 5-Star experience with us, Maggie! 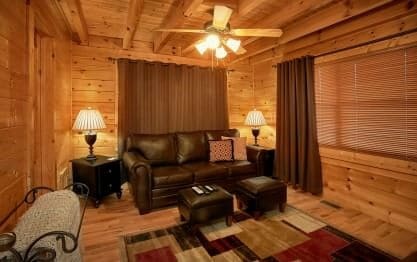 We are excited that you enjoyed your visit in the Sweet Retreat cabin. We appreciate your recommendation and would consider it an honor if you would join us again in the future. Please don't forget to take advantage of your 10% repeat guest discount at the time of your next booking! We loved the cabin!! It is gorgeous! Would love to stay again in the future and will highly recommend it to friends! We appreciate your business and wonderful 5 star review, Millie. We are delighted to hear your stay was exceptional. Please take advantage of your 10% repeat guest discount at the time of your next booking! This cabin was the perfect getaway for our 3rd anniversary. When we first arrived, the cabin was very clean and there were plenty of basic toiletries ready. The two jetted tubs and outdoor hot tub wer…e both super relaxing, and the media room was awesome - perfect for a Netflix binge! One caution: the top level of the cabin where the bed is, there are no coverings on the windows. So if you intend to sleep in and can't sleep in the daylight, make sure to bring a sleep/eye mask. 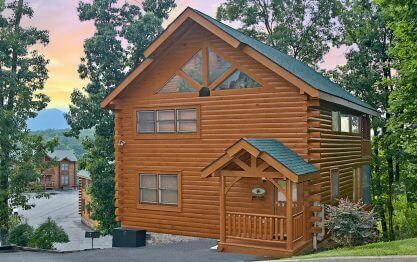 It was nice that this cabin was up into the mountains enough to feel secluded, but also not more than a 10 minute drive to Pigeon Forge dining and activities. Thank you for your 5-Star review, Dre'Anna! We are excited to hear you enjoyed your stay. We hope you will make plans to visit again soon! "Pigeon Forge long weekend "
We are pleased to hear that you enjoyed your time at A Sweet Retreat and hope you will be back for a future stay. Elk Springs Resort offers all return guests a 10% discount off their next stay. Hurry back! More fun awaits in the Great Smoky Mountains! This cabin was amazing!!!! It was in the perfect location for us, out of the hustle and bustle but close enough to everything too. IT WAS over the top gorgeous!!!! We didn't want to leave even after 4… nights. Elk Springs was wonderful to deal with. I loved their emails and their texts. They were always available and helpful. This property and this rental company gets a 100 from us. I have NO negatives and all positives!!!!! Thank you for a fabulous Spring Break!!!! Thank you for your wonderful review! We love to hear how much you enjoyed your stay. 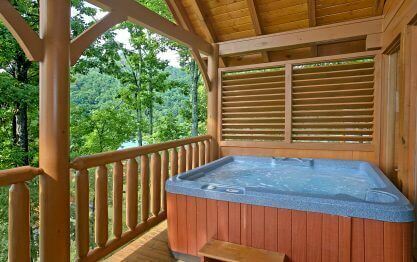 We certainly agree, A Sweet Retreat is sure to become a new favorite while staying in the Great Smoky Mountains. We hope you will consider staying with us again during your next visit to our area. It was a great stay in Sweet Retreat. We appreciate your business and thank you for taking the time to give us such a nice review. We hope you will consider a return stay with us and take advantage of our repeat guest 10% discount. As usual and expected the cabin getaway was top notch. 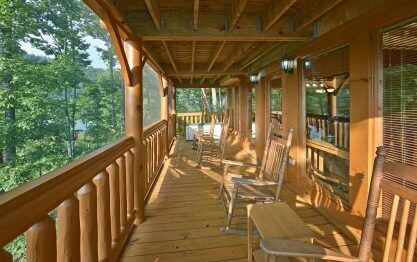 Beautiful views from the deck as well as easy access to Pigeon Forge. Thank you for your 5-Star review, Duane! We are happy to hear your stay was exceptional. We hope you will consider staying with us again during your next visit to our beautiful Great Smoky Mountains! My wife and I really enjoyed our stay at A Sweet Retreat. 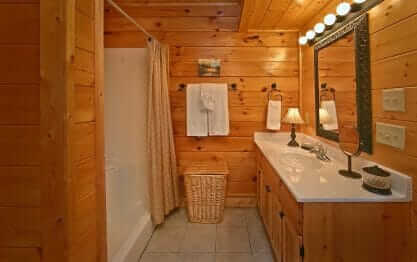 The cabin was clean and cozy and conveniently located right near pigeon forge where all the stores and attractions are. Thank you for your kind review, Fred. It is our pleasure to provide you with that home-away-from-home experience when you stay in one of our beautiful cabins. We appreciate your business and look forward to having you as a repeat guest in the future! The sole purpose of our trip was to get away from the hectic-ness that come with a busy family and professional life. We were able to unplug, detach, unwind and reconnect as a couple. 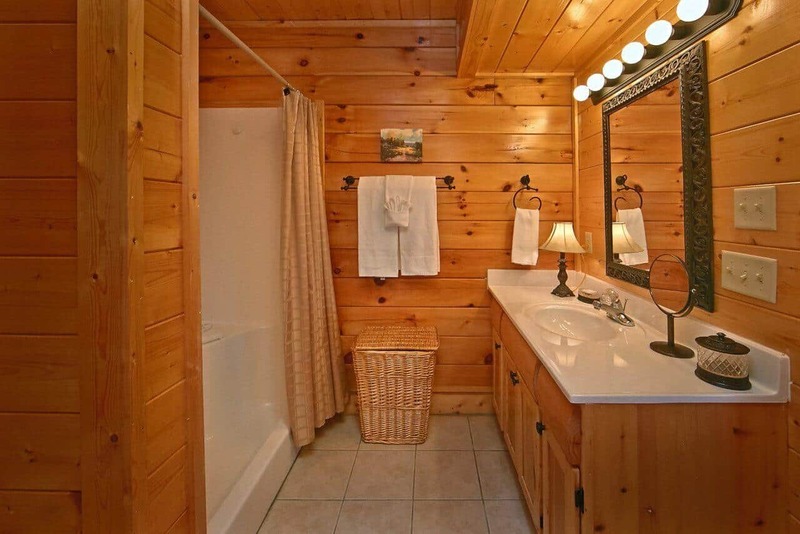 If you are loo…king for a quiet retreat location this is definitely it! We are very pleased to hear that your cabin choice was such a hit! It is important to rest, relax and recharge once in awhile. Life can become very hectic and we welcome the opportunity to provide our luxury cabins for you to enjoy. We hope you come back soon for more Smoky Mountain memories! We arrived to our Wears Valley cabin rental only 5 days after the Gatlinburg fires. We were worried about a smoke smell or dangerous conditions but our worries were quickly put to rest! While we didn'…t enter Gatlinburg the Great Smokey Mountains are as beautiful as ever! My husband and I enjoyed a PERFECT 25th wedding anniversary at a Sweet Retreat! The cabin was awesome, just as we've come to expect from Elk Springs Resort and the people of the community were great. We were thanked continuiously by people in the area from the grocery store and trolley drivers to the resort and restraunts for keeping our plans to spend our anniversary there! The views were amazing and the rains cleared the smoke smell in the areas we were in. God truely is good and while there was certainly devestation tothe area the resiliance of these people and this place speaks to their faith and Gods grace and protection for us! Can't wait to go back! Thank you for allowing us to be a part of such a wonderful celebration, Traci! We were honored to have you as our guest. We appreciate your kind words and support! We are very fortunate, as the main areas throughout town were spared. While there are areas that were heavily impacted, most of them are away from downtown. The natural beauty that we love to share with our guests is intact and as beautiful as before. We hope you will make plans to come back and visit often! Please keep in mind, as a returning guest you will enjoy 10% off all future stays. Hurry back, your next adventure awaits! Thank you for choosing Elk Springs Resort, Brad! We are pleased to hear you had an exceptional stay. We hope you will consider staying with us again during your next visit to Gatlinburg. Wonderful home with beautiful view. We are thrilled to hear you enjoyed your stay with us. 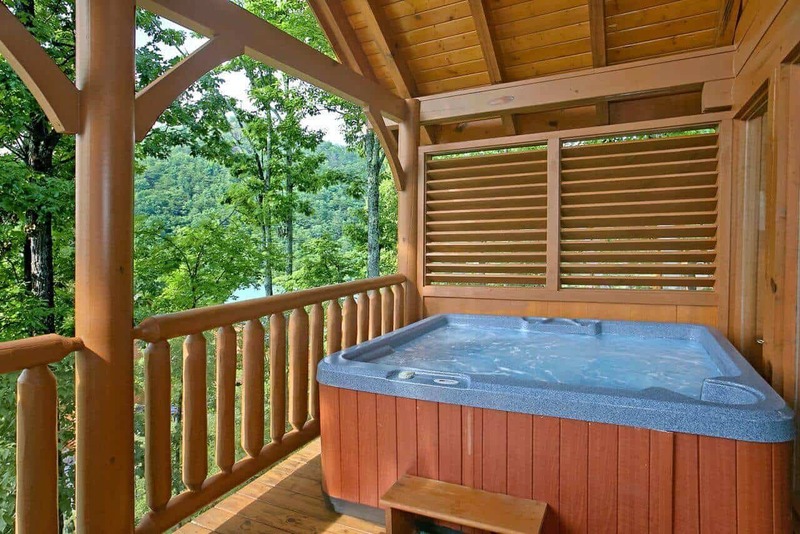 We certainly agree, Sweet Retreat is an exceptional cabin with top-notch amenities and breathtaking views. We hope you will make plans to come back and visit with us again. We hope to see you soon! Thank you for your kind review, Christopher! We are happy to hear your stay was exceptional. We enjoyed having you as our guest and hope you will make plans to stay with us again! 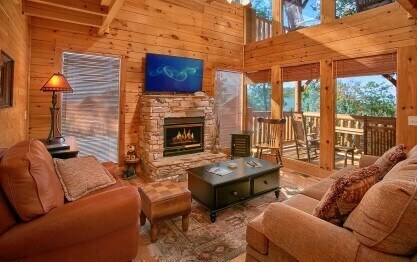 This cabin by far was the best we stayed in and we come to Gatlinburg every year. Wow! We love hearing that the cabin exceeded your expectations, Nikkita! We hope you will consider making Elk Springs Resort a part of a new tradition when visiting Gatlinburg. Come back and see us soon! For a first timer this cabin was exceptional. It was very peaceful, clean and I loved it. It was a great mini vacation for my fianc� and me for his birthday. I can not wait to come back. I will be bo…oking with these cabins again. They were great people to talk to and the pricing was great for our stay. Thank you for allowing us to be a part of such a special celebration, Ronitra! We are delighted to hear your stay was exceptional. We would consider it an honor for you to stay with us again. Please keep in mind, as a returning guest you will enjoy 10% off all future stays. Hurry back, new memories are waiting to be made! We really enjoyed our stay at the cabin. We are so happy that you enjoyed your stay last February! We thank you so much for giving us such a wonderful review. We hope that you will be coming to stay with us again soon! Remember, all return guests receive a 10% discount on all future stays. 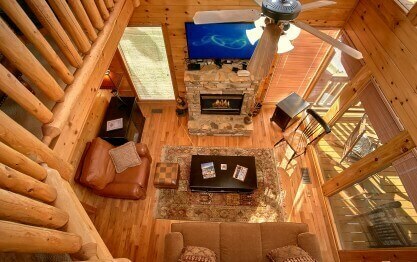 Once we finally got to our cabin it was amazing!! The 13 hours we spend stuck in the parking lot that used to be Interstate 75 in Kentucky was not so amazing. The soak in the hot tub with the snow gen…tly falling was so worth it! Would love to come back!! Thank you for your review, Kara. We are glad that you were able to safely navigate your way through the snowstorm to arrive at your destination. Mother Nature has a way of just showing up when we least expect it and we have to make the most of it. After all of the stress with your drive, I am sure the hot tub was a welcome distraction! No matter how cold the air temperature is, that 104* hot tub water is just amazing! We hope you get the chance to come back and stay with Elk Springs Resort. Perhaps a fall trip would be perfect for enjoying the beauty of the Great Smoky Mountains next time! Thank you for your business and for the wonderful 5-star review, Christopher! 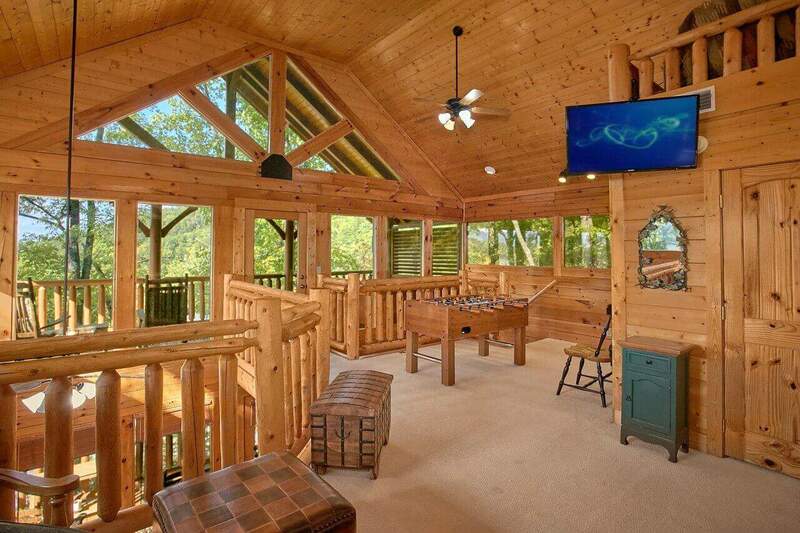 We are so pleased that you found your perfect cabin to escape to here in the Great Smoky Mountains of Tennessee! Please consider a future stay with us and take advantage of your 10% repeat guest discount. The cabin was amazing. Clean & spacious. Secluded & private. I definitely recommend it especially for couples. Amazing place. The cabin was very clean. Staff is extremely courteous. Looked gorgeous in the snow. View was not the absolute best, but still very nice. We are pleased to hear you had a great vacation! The snow adds a magical quality to our beautiful Smoky Mountains. 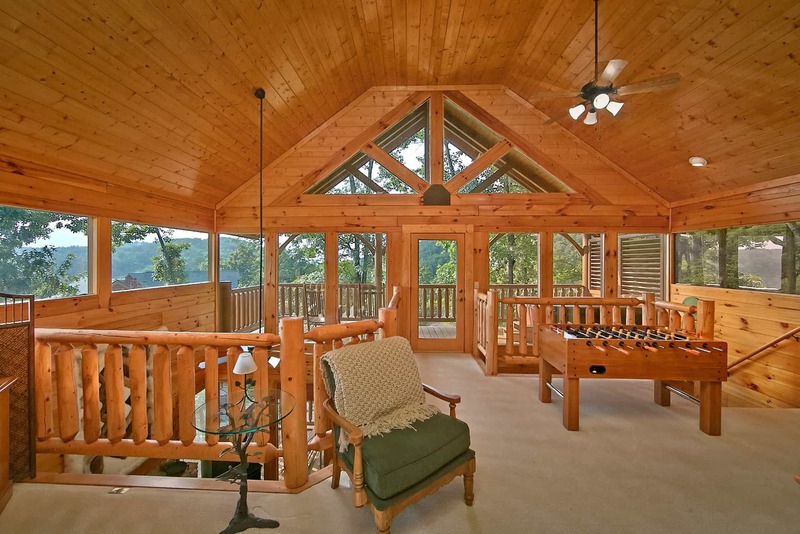 We have a variety of cabins that offer breathtaking views. 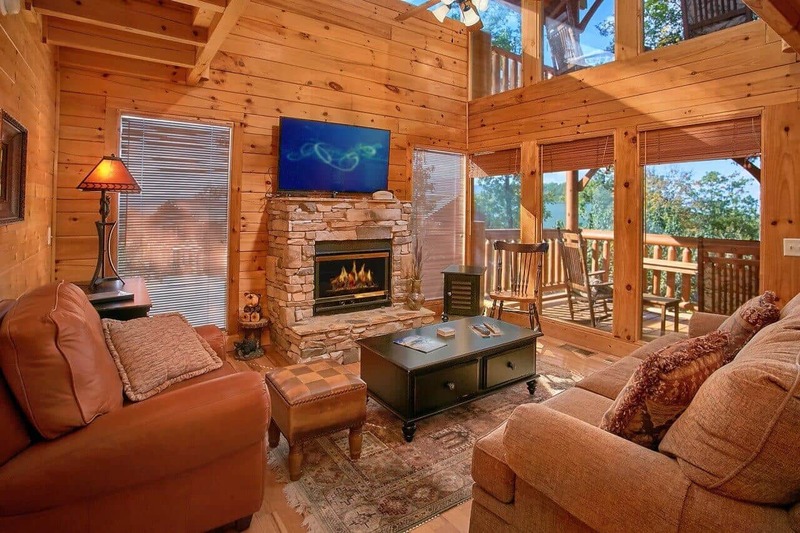 Please contact one of our sales representatives when you are ready to start planning your next get-away, they can assist you in finding a cabin that can offer a view that will amaze you! Thank you for your kind words, Heather! We are delighted to hear that we exceeded your expectations. We are happy you enjoyed your visit and hope you will consider staying with us again during your next visit to The Great Smoky Mountains. "2 Day Anniversary Get Away"
Sherry, thank you for your feedback. 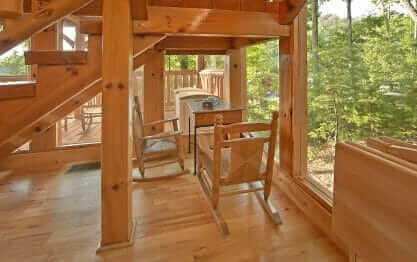 It is our pleasure to offer you a fantastic cabin to spend your anniversary get away in. We hope you will consider a return visit with Elk Springs Resort! Loved This Cabin. Our third reservation with Elk Springs Resort - every time we have been very satisfied. This cabin was awesome. Thanks! We value your loyalty to Elk Springs Resort, Larry! Thank you very much for you kind words and wonderful 5 star review. We do hope to see you again in the near future. Hurry back, more memories are waiting to be made! We are happy to hear you enjoyed your stay. We do hope you will join us again again in the near future. Hurry back, more memories are waiting to be made! The cabin was more than we hoped for. It was clean, the kitchen was well stocked. The views were breathtaking. Thank you Kenneth! We appreciate you taking the time to give us this nice review. As always, it is our pleasure to provide you with a positive cabin rental experience. We hope you will return for more Smoky Mountain memories in the future! Tyson, we work hard to provide you with the best cabin rental experience possible. Your feedback is greatly appreciated, as it lets us know that we continue to do a great job! We are pleased to hear that the theater room and the hot tub were a hit. We hope you hurry back for some more Smoky Mountain memories soon! Cabin was very clean and in excellent shape. Really surpassed our expectations. It had plenty of towels and toilet paper, paper towels, soap, utensils, etc. My only complaint was the hot tub had an "H…L" error code, which apparently keeps it from ever getting hot. Would highly recommend making sure it works the first night rather than the last, like I did. But otherwise, would still recommend staying here. Thank you for your review Chris. An issue with your hot tub apparently occurred after you checked in. Our hot tubs are drained, sanitized and refilled prior to every check in and they are also tested to be sure they are working properly. We would have welcomed the opportunity to correct this issue for you while you were our guest. Our maintenance staff is on site and available up until midnight each night and can be dispatched to your cabin usually arriving within 30 minutes. Thank you for understanding that problems do arise and we are just a phone call away to resolve any issues during your stay. Everything was absolutely perfect. Everything we needed and didn't need was available in the cabin. Plenty of space. Beautiful views. Very relaxing environment. Alpt to do on the town. Perfect vacatio…n for Amy occasion. Can't wait to go back! And staff(Louise) was very helpful. We appreciate your business and wonderful 5 star review, Illissa. We certainly hope you will join us again in the near future. Remember to mention you have stayed with us before so you will receive a 10% repeat guest discount. Hurry back, more memories are waiting to be made! Great vacation experience - clean cabin, gorgeous view and overall a wonderful choice! We appreciate your great review Amanda! Great to hear the satisfaction in your response regarding your cabin vacation experience. Bring your family and friends on your next visit and upgrade to one of our larger cabins and receive a 10% discount off your next booking! 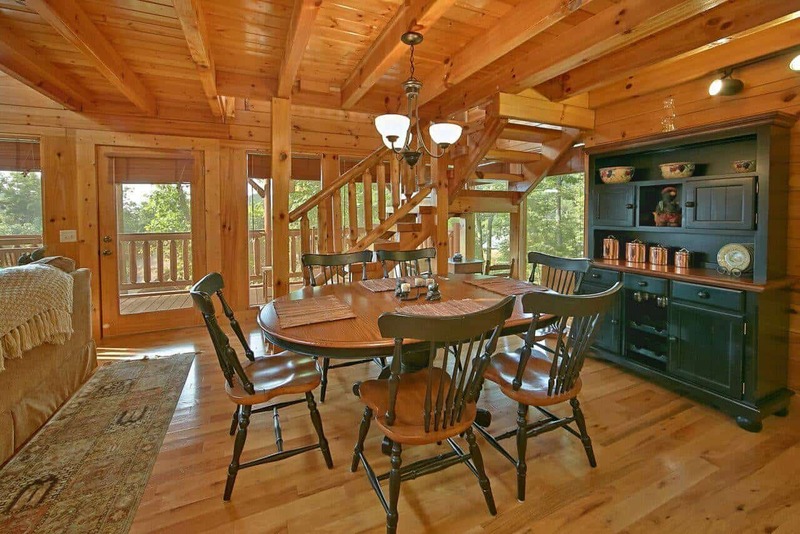 "Beautiful cabin.....was everything I expected and more!!!!!" Cabin was decorated beautifully. Every thing was amazing including check in and check out process. Awesome weekend! Wood highly recommend this resort! Meredyth, we appreciate another 5-star review from a satisfied guest. We do hope you come back and stay with us again and use your 10% repeat visitor discount on any future stays. "Great time in the Smokeys"
The cabin was awesome. Easy to get to and its only about 4 miles from Pigeon Forge. Great views from both decks. We could not have been happier with our cabin. We appreciate your wonderful review, Chad. 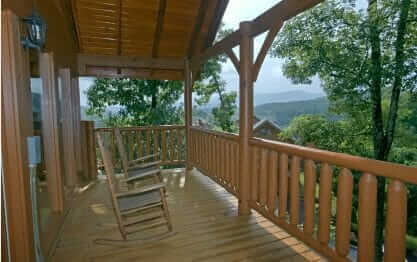 We would be love for your to join us again during your next visit to The Great Smoky Mountains! 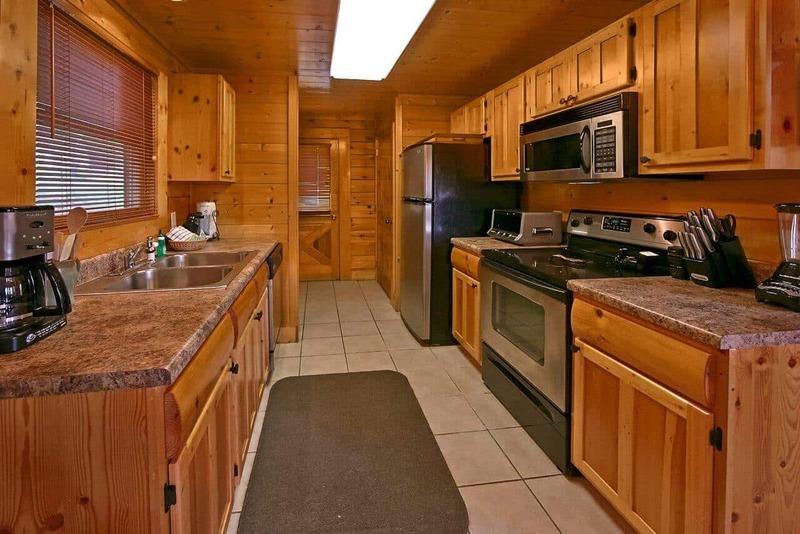 "Wonderful location, beautiful cabin - A Sweet Retreat"
We can't say enough about this beautiful, clean, fully stocked, and perfectly located cabin experience!! We stayed in A Sweet Retreat and it looks brand new - the hot tub was clean and perfectly situa…ted on the deck for optimal viewing of the mountains and privacy; the kitchen had all that we needed and the charcoal grill was great; the media room was WOW! Best tv ever and great streaming video; the king bed was super comfy and everything was so clean. We are already planning our next trip! My wife and I stayed at the Sweet Retreat for 4 nights as we celebrated our anniversary. The home was true to the pictures on the website. 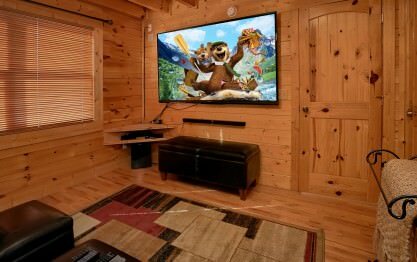 The house was clean and modern, and we thoroughly enjoyed the… media room with a large TV, as well as the hot tub that is on the deck of the second floor. I would say the only negative of the home was that we thought we would be a bit more secluded from the other cabins. In reality, we were quite close, but it was still a great experience. The cabin was more than I expected. It was very roomy. The amenities were very nice and good quality features. The bed was very comfortable. All in all one of the best places I have stayed.